Gemini South’s next-generation astronomical instrument produces the highest angular resolution and widest field of view images ever captured from the ground using laser guide star adaptive optics techniques. On December 16, 2011, a decade of hard work culminated at the Gemini South telescope in Chile when a new generation of adaptive optics (AO) produced its first ultra-sharp, wide-field image. The target, a dense globular cluster of stars called NGC 288, reveals details at nearly the theoretical resolution limit of Gemini’s large 8-meter mirror. The crispness of the first light image clearly demonstrates the potential of the new system, which is poised to provide astronomers with a powerful tool for the study of a wide range of phenomena, from black holes at the centers of galaxies to the life histories of stars. Called the Gemini Multi-conjugate adaptive optics System (GeMS for short), it uses five artificial guide stars made by a laser to provide unprecedented clarity over the largest area of sky ever captured in a single observation of the night sky with adaptive optics –– an area ten times larger than that covered by any other comparable AO system in the world. The following story provides a short history on, and the details of, this milestone. Also see the Gemini press release on GeMS first light here. Figure 1. Gemini South’s “first light” image from GeMS/GSAOI shows extreme detail in the central part of the globular star cluster NGC 288. 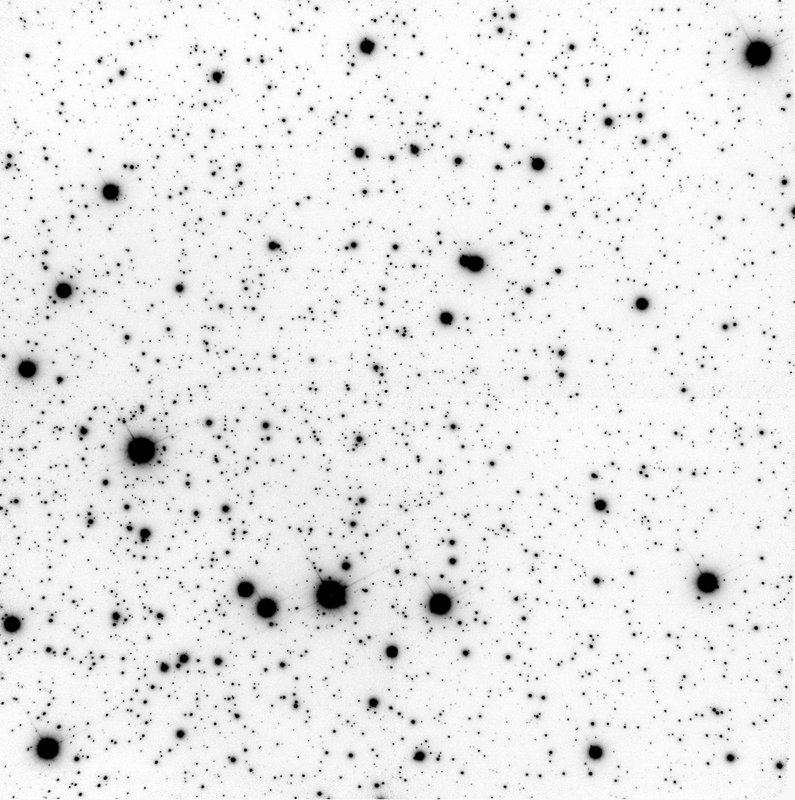 The image, taken at 1.65 microns (H band) on December 16, 2011, has a field-of-view 87 x 87 arcseconds. The average full-width at half-maximum is slightly below 0.080 arcsecond, with a variation of 0.002 arcsecond across the entire field of the image. Exposure time was 13 minutes. Insets on the right show a detail of the image (top), a comparison of the same region with classical AO (middle; this assumes using the star at the upper right corner as the guide star), and seeing-limited observations (bottom). The pixel size in the latter was chosen to optimize the signal-to-noise ratio while not degrading the intrinsic angular resolution of the image. North is up, East is right. 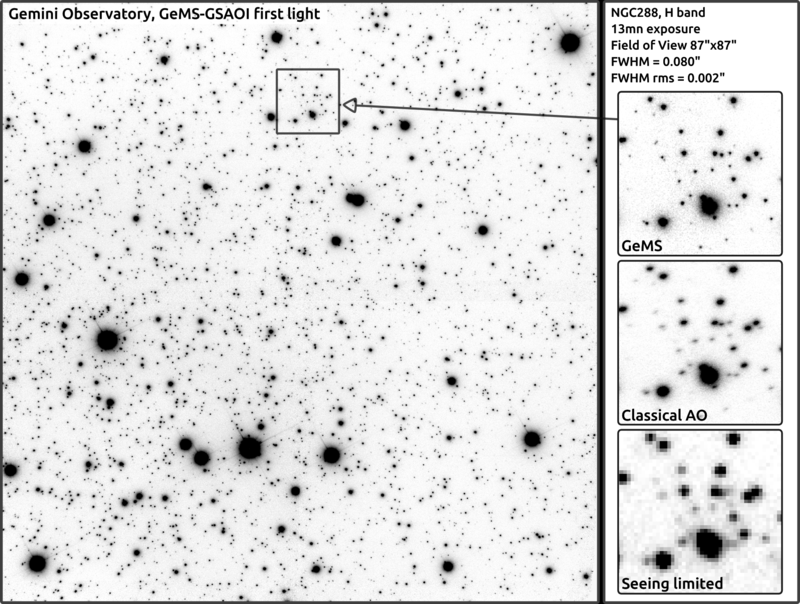 Figure 2.This H band GeMS/GSAOI image of the open cluster NGC 2362 is a record breaking image. This image is a composite of thirteen 15 seconds images, obtained during GeMS tuning tests during the night of December 18. The average angular resolution on this composite image is about 0.055 arc second, with a Strehl ratio of 30%. Several individual images that served to build this composite had an angular resolution below 0.050 arc second and a Strehl ratio in excess of 40%, which is significantly better than any image obtained with a laser guide star AO system to date. The field of view is 85 arc seconds squared. The white bands between the four GSAOI detectors are the gaps between the arrays, where no signal was collected. North is up, East is right. The Earth’s atmosphere — which enables life on our planet — has two detrimental effects for astronomical observations. First, it filters out many parts of the light spectrum, like much of the ultraviolet and portions of the infrared. Second, warm and cold air mixing together create atmospheric turbulence which causes starlight to twinkle and ground-based telescopic images to blur: a phenomenon called "seeing." To surmount these two problems, astronomers and scientists sent telescopes into orbit. This was very successful, but also very expensive; to this day, it is extremely challenging to send large-aperture telescopes into space and stay within an affordable budget. In the 1950s, astronomer Horace Babcock, then at Mt. Wilson, invented adaptive optics (AO). The method uses a combination of light-wave sensors and deformable mirrors to compensate in real-time for the light-wave deformations caused by ”seeing.” As it does, AO un-poetically removes the twinkle from the stars and restores to near perfection the ultimate angular resolution limit from telescope optics — as if the atmospheric turbulence didn’t exist. The first prototypes for astronomy were built in the 1980s. Using AO on current large telescopes typically means being able to see about one hundred times more detail in images of planets, stars, nebulae or galaxies than telescopes without AO. But, adaptive optics (as originally conceived) had some shortcomings. First, to measure distortions to the light-wave fast enough (to cope with the quickly changing atmospheric turbulence), the systems needed a bright guide star. Second, AO corrected the images in only a small angular patch (or field-of-view) around the guide star. Together, these two constraints meant that astronomers could use AO to cover only a small fraction of the sky. Lasers solved the first problem. When no "natural" guide star was available, an artificial one could be created using a powerful laser emitting light at the well-known orange color used in some street lights (see http://www.gemini.edu/node/11599). Then came Multi-Conjugate Adaptive Optics (MCAO), which solved the second AO shortcoming: limited field-of-view. By using multiple guide stars, tomographic techniques, and several deformable mirrors, MCAO extends the field of view of AO systems by ten times or more, and produces images with exquisitely uniform image quality. 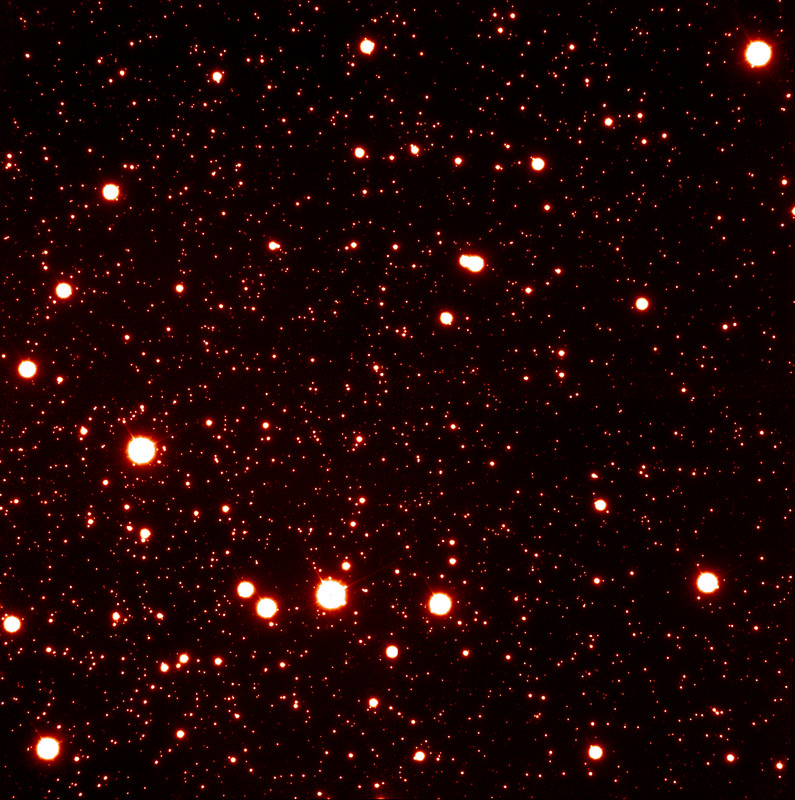 The Gemini Multi-Conjugate Adaptive Optics System (GeMS), an instrument now being tested at Gemini, is the first of its kind: a laser guide star MCAO system. 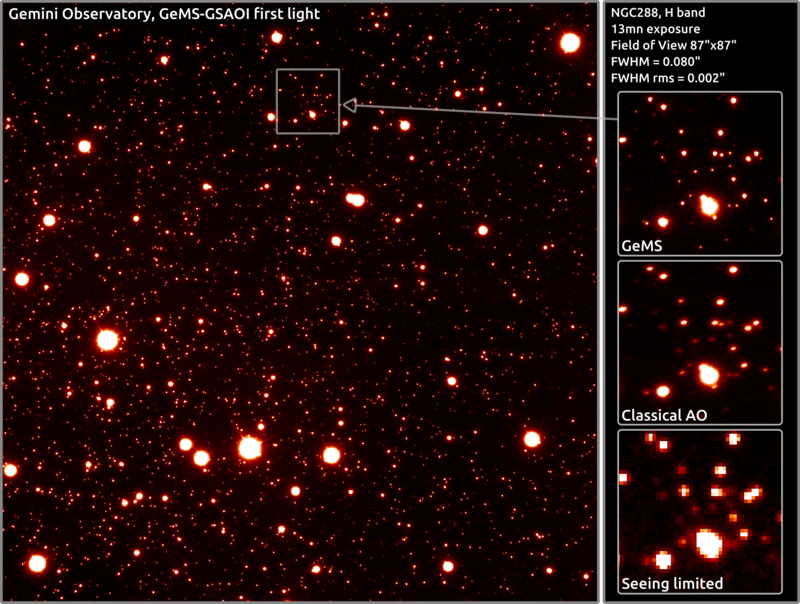 GeMS uses five laser guide stars, three deformable mirrors and a battery of computers to provide a near diffraction limited1 image to the Gemini South Adaptive Optics Imager (GSAOI, build by the Australian National University): the infrared-sensitive imager attached to it. This ultimately means image’s angular resolution (the size of the smallest detail that can be resolved) of 0.04 to 0.06 arcsecond over a field of 85 arcseconds squared, which significantly beats the typical resolution in "seeing" limited (non-AO) conditions of 0.5 arcsecond at good astronomical sites. GeMS development started at Gemini in the early 2000s. It was put together in the Gemini instrumentation laboratories over the past four years, and finally field-tested on the telescope during several "commissioning" periods in 2011. The powerful sodium laser and its projection system were commissioned beginning in January and extended through March 2011. Then, after a brief shutdown during the less-weather-friendly Southern Hemisphere winter period, the GeMS team returned to the telescope, ready for the final tests. A decade of hard work culminated during the observing period just before Christmas, when GeMS more than fulfilled Gemini astronomers' expectations. 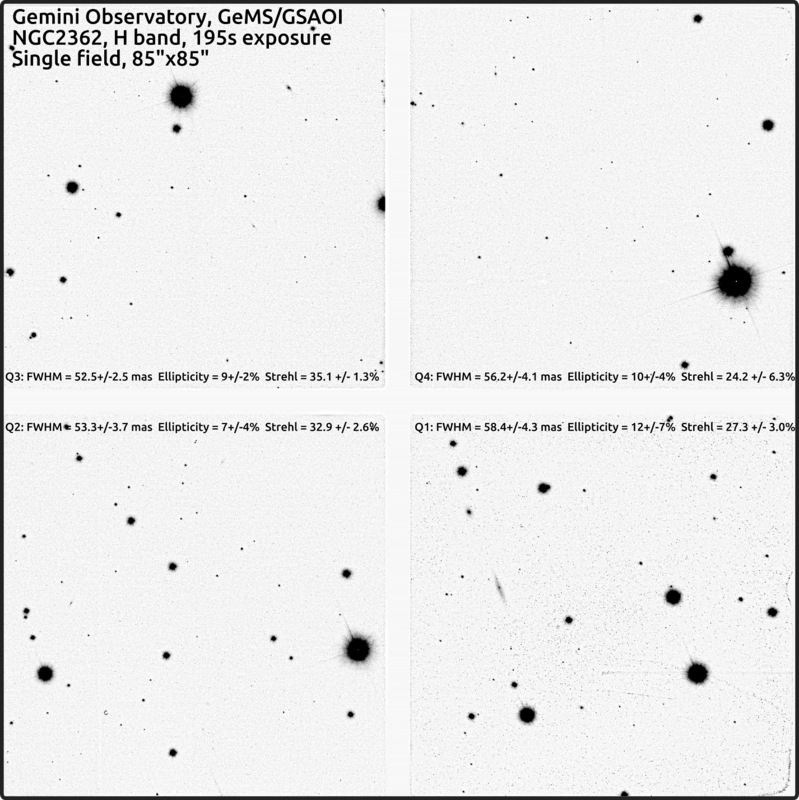 On the night of December 16, 2011, a night blessed by clear weather and good "seeing," the GeMS team obtained a surprisingly large and crisp first light image with an exquisitely uniform quality across the entire field. 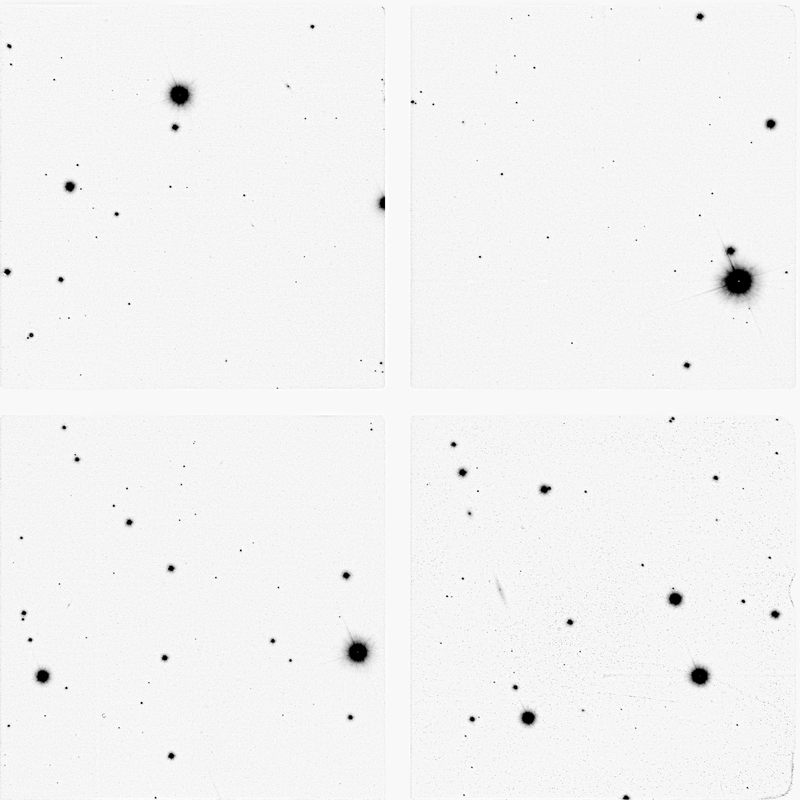 When compared with regular AO images (where corrections become less effective away from its single guide star) the contrast was striking – even though the field-of-view was several times larger than that in regular AO-corrected images. The image of NGC 288 (shown above) reveals thousands of pinpoint stars. With the new gain in angular resolution, this crowded globular cluster now appears no more dense than a typical field in the Milky Way. After achieving the first night’s images, the astronomers dedicated the next couple of nights to making images of various objects, to help the team investigate and demonstrate the power of GeMS. “This is somewhat uncharted territory: no one has ever made images so large with such a high angular resolution. What pops up on the screen is a bit of a gamble — but this is the curse and joy of discovery,” said Gemini AO scientist Benoit Neichel. The team next imaged a group of galaxies, called the Hickson Compact Group 32, was imaged with an angular resolution down to 0.052 arcsecond, certainly the best view of an extragalactic object obtained to date with LGS AO techniques. During the course of system-tuning tests performed on December 18th, the team obtained images with an angular resolution down to 0.049 arcsecond and Strehl ratios2 up to 40 percent at 1.65 microns, a performance that has never been achieved with LGS systems. Additionally, GeMS provided these results over a field of view 10 times larger than any other AO system in the world. GeMS/GSAOI will resume and complete commissioning during the next six months, focusing on stability, performance optimization, and integration into operations. It will gradually be opened to the Gemini astronomy community during 2012, and will, without a doubt, lead to numerous astronomical discoveries. (1) The diffraction limit is the ultimate angular resolution limit imposed by the laws of optics and is equal to the ratio of the observing wavelength to the telescope diameter. Thus a larger telescope diameter leads to a smaller image, which means that Gemini — an 8-meter telescope — when equipped with AO, has about three times the resolving power of the Hubble Space Telescope at the same wavelength. (2) The Strehl ratio is a measure of how close the image is to the diffraction limit. A Strehl ratio of 100 percent means perfectly diffraction-limited. Regular "seeing-limited" images obtained in the near-infrared with state-of-the-art large telescopes typically have Strehl ratios of about 1 percent.